Personally, I really liked Tanawayo Bay. I spent a lot of time there fine tuning the terrain. It is especially remembered for a particularly technical stretch of the Trans Irukandji Causeway which linked the central raised atoll to Coraki Lagoons and Jackaroo Island. Other neighbouring regions were Barramundi Bay, Captain Cook Reef, Whitsunday Island, Coolangatta, Byron Bay, and Mantaray Shoals. Tanawayo Bay was light residential. Three landholders from England and Mexico called the sim home, and it enjoyed 100% occupation throughout its life. Of all the 12 sims in Jillaroo State, I remember Tanawayo Bay as my favourite. 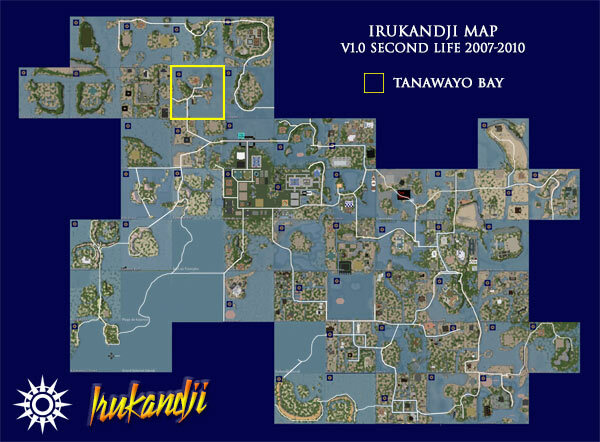 Regrettably, thanks to 'the great hard-drive crash of 08', I have no photographs of Tanawayo Bay except the aerial map above. If you happened to have visited there and took photos and wish to share them on this page, please let me know via the comment section below.